The Urban Decay Naked Palette is a must have this summer because we all want to look good! As another makeup favorite of mine the timing is perfect to give it away. Enjoy, from Le Chateau des Fleurs. This long, lean, seductive case is packed with TWELVE gorgeous neutrals. Shades range from delicate champagnes to dark, gritty gunmetal, with names like Darkhorse, Virgin and Buck. We’ve also included a range of textures: everything from glitter to shimmer to matte. AEWR Turbo Wrinkle Smoothing TreatmentThe name says it all. If there is one turn back the clock product that every person over 25 with skin should have, this is it. Restore firmness, heal sun damage, increase hydration, erase wrinkles, smooth texture, nourish at the dermal layer, minimize irritation, increase skin brightness and even out skin tone. 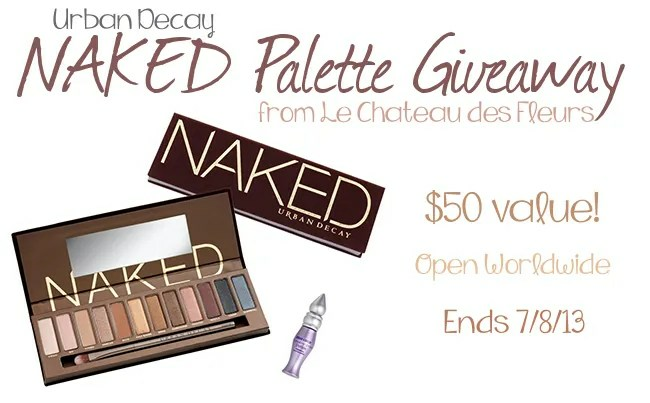 Enter to win the Urban Decay Naked Palette:Open worldwide. Ends 7/8/13. Entries will be verified. See Rafflecopter for full Terms.